You might ask, what's this? I like to identify plants which are in my garden but have no clue about. The other day, I was wondering about this plant. A clue to my search was observing that the fallen leaves develop new plants at the edges. This is typical of the Bryophyllum section of plants. 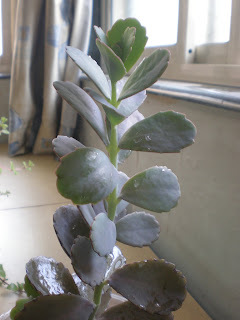 A little bit more of searching through pictures threw up this name- Kalanchoe fedtschenkoi synonym Bryophyllum fedtschenkoi also called Aurora-borealis plant. The general name sounds better than the botanical name which is in honor of a Russian botanist of same name. This succulent belongs to the group Bryophyllum the genus Kalanchoe of the Crassulaceae family. There are about 20-30 of this group, of which I am happy to have one. It is also called lavender scallops due to the shape and color of its leaves. All plants in this group develop small plantlets at the leaf margin which can eventually give rise to new plants, case of asexual reproduction. The picture on the left does not show the original leaf as I covered it with soil. I saw some peculiar flowers on this plant on this site. I have never seen any flowers on this plant so assumed that this is good as a foliage plant only. I am waiting to see if my little fellow will flower for me too. 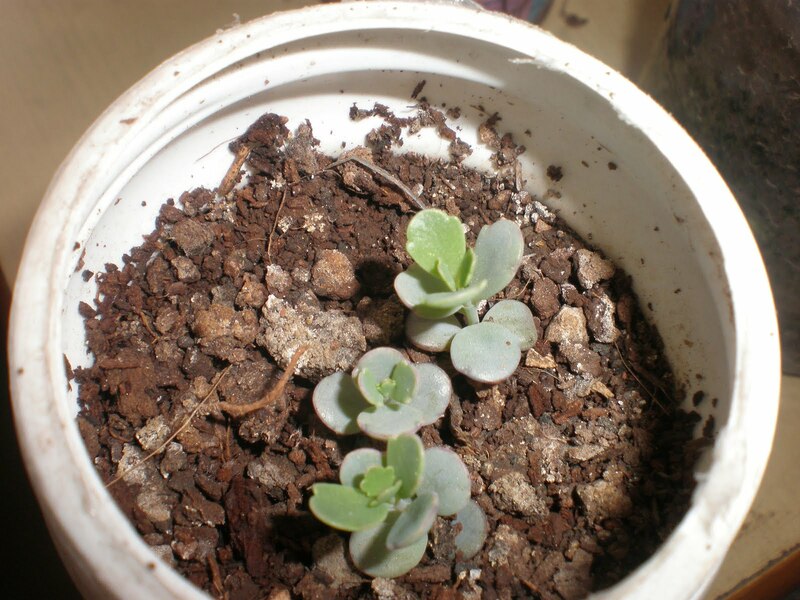 I need to transplant it to a soil more fit for a succulent; more sand for the soil to drain well and will also add some pebbles on the top for drainage and show. And also watch for the flowers!